Well Yes I’m a Nerd But… What Kind? By the way I copied and pasted the code and the formatting didn’t show up for me so I did a screenshot. Hope everyone had a wonderful weekend! I passed my 200th post this weekend. My kids said I was getting old but wow! I don’t know about everyone else but this is the first week of school with students for us so say a prayer watch the traffic, eat healthly, get plenty of rest, drink fluids – oh wait that’s the flu! Do whatever it is you need to have a great week and a great year! This entry was posted in Fun, Web on August 26, 2007 by Dee. On the quiz, I shouldn’t be critical of you at all. 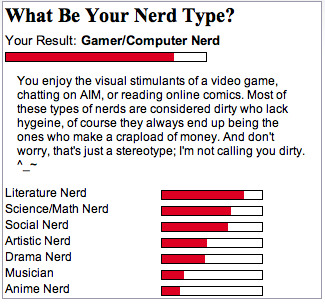 Our first two nerd types are the same, just switched. Guess that’s why we get along so well, huh? Enjoy your weekend. I’m proud of you and your shopping expedition!